Spirit Photography is a fact. During Halloween week, Shades Of The Departed will focus on Spirit Photography and its origins as well as six degrees of separation between the subject and the footnoteMaven. 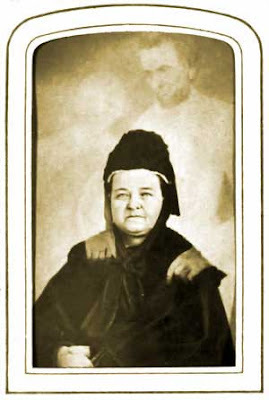 Mary Todd Lincoln's spirit photograph is a fact. Fact - Maria Bash was married to Samuel Coulter, had a daughter named Jerusha and a grandson named Wallace who was a photographer. 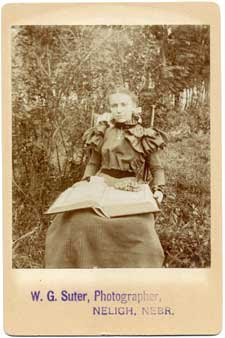 Fact - this photograph taken of Maria Bash by her grandson Wallace Suter. Fact - the mourning broach is fact. The family does not know who is pictured. 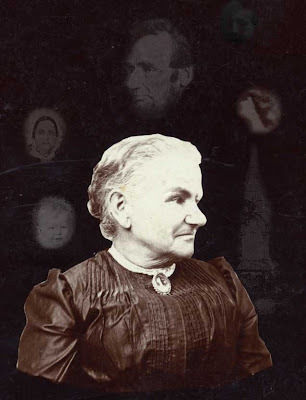 The spirit photograph and the entire story is a work of fiction! I offered two rather obvious clues. 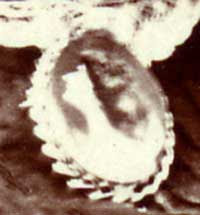 The title of my article was "Maria Bash and The Spirit Hoax," not "Spirit Photograph," and it was just that - a hoax! I also added a more subtle obvious clue. "It was said a cat had run across the path of the carriage causing the horse to bolt and Jerusha to be thrown, breaking her neck." Perhaps I should have made the cat black, but the cat has been a feature of most all Halloween stories since their beginning. You will notice I did not have the accident occur at Halloween so that the cat would stand out. Only Terry Thornton of Hill Country commented that it was fiction, but I can't give it to you Terry for your logic was flawed. This was so much fun! Thank you, Jasia, for a great 58th Edition of The Carnival of Genealogy. Fallis, S.W. 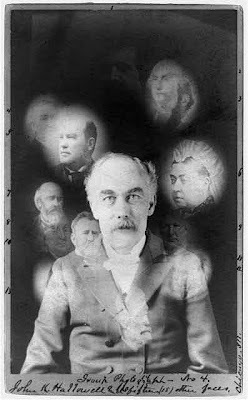 [Spirit photograph showing half-length portrait of John K. Hallowell, facing front, and super-imposed faces of fifteen deceased people.] Cabinet Card. Chicago: J. K. Hallowell, 1901. From Library of Congress: Spirit Photograph Collection. http://hdl.loc.gov/loc.pnp/cph.3b45006 (accessed October 12, 1008). Mumler, William. 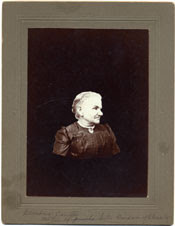 “[Mrs. Lincoln Spirit Photograph]” Carte de Visite. c1875. From World Almanac. (accessed October 10, 2008). Maria Bash Two Views. Wallace Grayson Souter. Card Mounted Photograph. 1900. Privately held by the footnoteMaven, [ADDRESS FOR PRIVATE USE,] Preston, Washington. 2005. Maria Bash Spirit Photograph. Wallace Grayson Souter. Digital Manipulation. 1900. Privately held by the footnoteMaven, [ADDRESS FOR PRIVATE USE,] Preston, Washington. 2005. 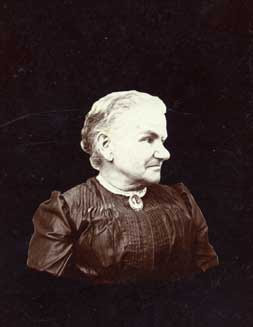 Ella Coulter Dillon. Wallace Grayson Souter. Cabinet Card. Unknown. Privately held by the footnoteMaven, [ADDRESS FOR PRIVATE USE,] Preston, Washington. 2005. Flawed logic! LOL! I knew there would be a Catch 22 in this one --- so I don't win the prize after all. Thanks for a fun lesson, Maven, into spirit photography. COG58 was most interesting wasn't it?